Congress is considering new legislation that would cut U.S. contributions to a key United Nations agency responsible for Palestinian refugees and change the official definition of a refugee in a way that could strip such status for millions of Palestinians, according to new legislation. Legislation introduced by Rep. Doug Lamborn (R., Colo.), a member of the House Armed Services Committee, seeks to redefine how Palestinian refugees are viewed by the international community, reducing millions in U.S. aid dollars to the U.N. Relief Works Agency, or UNRWA, which currently provides resources to some 5.3 million refugees. The Trump administration significantly reduced U.S. funding to UNRWA earlier this year in a bid to reform the embattled agency, which has long faced accusations of anti-Israel bias and been ensnared in scandals regarding its material support to the Hamas terror group. Lamborn's legislation, which would scale back UNRWA's mission, comes on the heels of a congressional effort to compel the State Department to release a long classified report that is believed to show the number of actual Palestinian refugees is far few from the 5.3 million. Sources familiar with the report's contents say the actual number of refugees is closer to 20 or 30,000 and that U.S. officials have over classified these findings in order to prevent public disclosure that could cripple UNRWA. America has been UNRWA's largest financial donor since its inception in 1949. Since that time, the agency has faced multiple scandals and has been plagued by accusations it harbors an anti-Israel bias and disseminates such materials in its taxpayer-funded schools in the region. Lamborn, who also has been working to ensure the State Department release the classified refugee report, told the Washington Free Beacon that readjusting the official definition of a Palestinian refugee could change the calculus in the long-stalled peace process, a major sticking point of which has been the so-called right of return to Israel for Palestinian refugees. An influx of millions of refugees would erase Israel's Jewish majority. "It's critical that we return UNRWA to its original and intended framework. UNRWA's inflated refugee count is intended to increase the number of Palestinians that would receive the so-called right of return. U.S. funds should only go to UNRWA to the extent that they carry out their original mission of resettling refugees," Lamborn said. "Unfortunately, UNRWA has become another anti-Semitic and anti-American agency at the United Nations. It is time for the United States to address UNRWA's twisted definition of a refugee," Lamborn said. "This is the first step towards peace in the region." The legislation notes that in the 1950s, UNRWA altered its refugee requirements, enabling scores of Palestinians previously ineligible for refugee status to take advantage of the agency. "This change significantly inflated the number of purported refugees and subsequently the number of individuals who are eligible to receive UNRWA benefits," the bill notes. "This classification process is inconsistent with how all other refugees in the world are classified, including the definition used by the United Nations High Commission on Refugees (UNHCR) and the laws concerning refugees in the United States," the bill states. "Because of UNRWA's unique definition of a refugee, the number of Palestinian refugees has grown exponentially over the years, from approximately 600,000 in 1949 to 5,300,000 today." 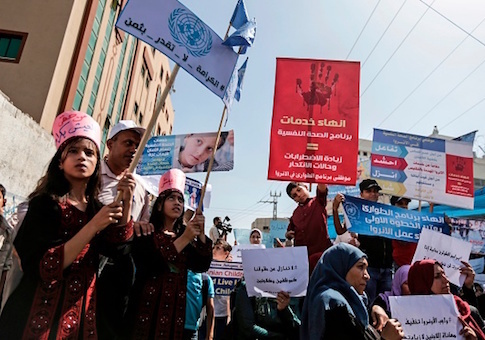 The issue is further complicated by multiple scandals in which UNRWA has been accused of anti-Israel bias and of working with Hamas terrorists. Hamas missiles, used to attack Jewish citizens, have been found stored in UNRWA facilities multiple times in the past years, including in UNRWA-run schools. If approved, the new legislation would limit the amount of U.S. taxpayer dollars allocated to UNRWA until it moves to resettle only original Palestinian refugees, as laid out in the law. This entry was posted in National Security and tagged United Nations. Bookmark the permalink.